The Museum of Lead Mining can be found high in the Lowther Hills in Wanlockhead, Scotland's highest village at 467m or 1,531ft. What you find is a truly outstanding visitor attraction offering a great deal to see and do in a fascinating setting. The museum should be on the "must see" list of anyone visiting southern Scotland: or, indeed, passing through it. Wanlockhead is only about a seven mile detour from either Junction 13 or 14 on the M74, and a visit should be considered by anyone using the motorway. The first surprise for those who don't know the area is that Scotland's highest village should be so far south. Wanlockhead is a beautiful place, especially on the sort of day shown in the pictures on this page. But you don't have to look very hard to see signs of past industrial activity. The clue to the origins of Wanlockhead can be found in the name of the neighbouring village, a mile and a half to the north east (and the second highest village in Scotland), Leadhills. This part of the Lowther Hills, once referred to as "God's Treasure House", is home to some 70 important veins of lead, plus less important but still significant deposits of zinc, copper, silver and gold. These mineral deposits were probably first exploited by the Romans, and from the 1200s they were being worked again by groups of miners who gathered here each summer. The first permanent settlement appeared in about 1680, when the Duke of Buccleuch built a lead smelting plant and workers' cottages that could be occupied all year round. The many lead mines in Wanlockhead thrived throughout the 1700s and 1800s. It is recorded that in 1876 no fewer than 274 men and boys were employed in the village's mines. Individual mines came and went depending on the viability of particular veins of lead, but the industry as a whole declined steeply in the early years of the 1900s and the mines in the village had effectively ceased to operate by the end of the 1930s. The focal point of the Museum of Lead Mining is an attractive range of buildings set in the heart of the village. Here you find the museum's visitor centre, home to the reception and shop, and to an impressively atmospheric exhibition in which you can explore the village's mining past. Here, too, you find the attractive tea shop and other visitor facilities, plus the gold panning area, which is open during peak periods. The visitor entre started life as the village's smiddy, before being developed into the museum in the 1980s. The hallmark of a really good museum is the extent to which is succeeds in meeting the differing needs and expectations of a wide range of visitors. The exhibition has something for everyone, and it doesn't really matter whether you want a truly in-depth understanding, or whether you have an attention span that competes for brevity with your three year old grandson's: either way you will take a great deal away from your tour. Those needing the full story will relish in the detailed information boards which look at every aspect of the geological background, the extraction of the lead ore, galena, and production of lead from the ore. Those here to look and feel rather than to read will enjoy the highly atmospheric way the exhibition area is broken down into a series of sets, many giving a strong impression of the claustrophobic working conditions of those employed in the industry. So far, so good, but there is far more to the museum. 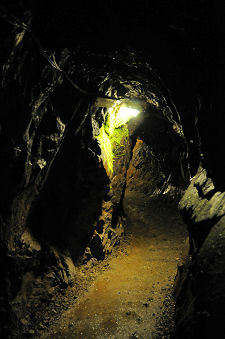 Guided tours set off from the visitor centre to explore a real lead mine, to take in a set of miners' cottages and the nearby beam engine, and to visit what some might consider the jewel in the crown of the Museum of Lead Mining, the miners' library. Anyone who's wandered around Wanlockhead will have noticed the very large disused mine a little distance down the valley to the north west of the village. 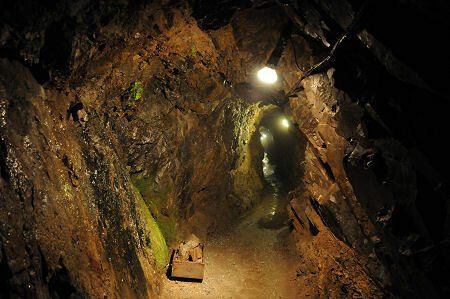 It's natural to assume that if you are going to visit a lead mine, then this must be it. In fact you visit Lochnell Mine, which worked its vein for a century and a half from 1710 to 1860 and whose very unassuming entrance can be found a couple of hundred yards along the same valley from the Visitor Centre. It is natural to think and talk of "descending" a mine, but not here. The Lochnell Mine extends back into the hillside behind, perhaps rising slightly as it does so (to drain water?) Visitors don hard hats and walk for a couple of hundred yards into the mine, which is plenty far enough to appreciate that while it is wonderfully cool on a hot day, it is not somewhere you'd really want to wish on anyone as a working environment: and remember you are seeing it with the help of electric lights, not the guttering tallow candles available to the miners and the boys employed to bring out the ore. Visitors' progress into the mine stops at a gallery which was formed by the intersection of different mining operations, and in which you can seen "miners" at work. The mine continues far beyond this point, but the the length of tunnel that can be visited really give a superb feel for the environment. A little further down the valley you come to the Wanlockhead Beam Engine. This "water bucket pumping engine", is almost all that visibly remains of the Straitsteps lead mine, one of the smaller and older of the village's mines. This mine was opened about 1675, and the beam engine replaced earlier and less effective methods of draining water from it in 1745. Just beyond the beam engine are the Straitsteps Cottages, a short run of three cottages that have been restored and furnished to show the domestic arrangement of miners in 1750, in 1850, and in 1910. 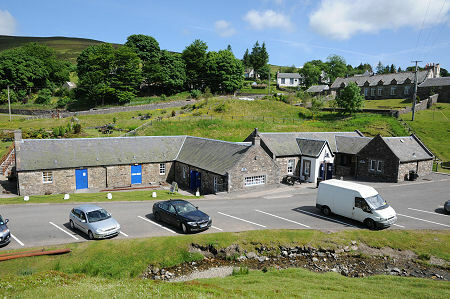 On the hillside behind the visitor centre is Wanlockhead's miners' library. This is the second oldest subscription library in Scotland (and Europe) and was established 'for our mutual improvement' on 1 November 1756 with 32 members. Europe's oldest subscription library was founded 15 years earlier in 1741 in nearby Leadhills. Membership of the library was not cheap, despite the costs being partly supported by the mining companies and by the Duke of Buccleuch. The sponsors all hoped that providing intellectual stimulation might ease Wanlockhead's reputation at the time for pretty wild behaviour by miners with nothing to do in their limited leisure time except drink. Externally, the miners' library is a simple whitewashed stone cottage. The interior, however, is truly magical, and the contents still more so. There are some three thousand books held here. The earliest dates back to 1616, and sixteen more were published before 1700. The library has a number of permanent residents, representing miners and the librarian, and while visitors cannot for obvious reasons handle the main collection of books, a number of reproductions of some of the most notable exhibits can be opened and looked at. It is worth coming to Wanlockhead simply to visit the library, but you don't have to, thanks to everything else the museum has to offer. Wanlockhead, By Biggar, ML12 6UT.